Everyone loves Oreos, right? (Well, OK there might be one or two people out there who don’t but we’ll just pretend they aren’t invited). And these Oreos are covered in chocolate which makes them even more delicious. 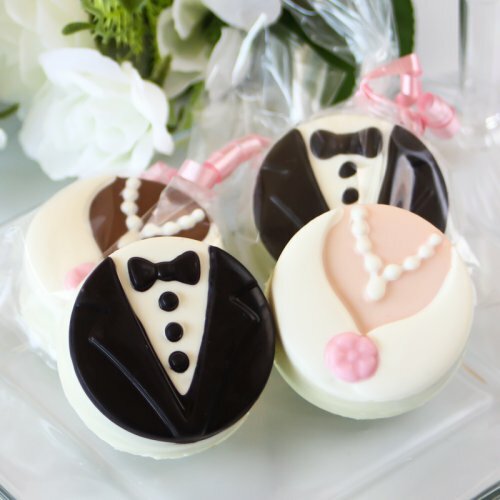 Each cookie is covered in chocolate and then designed to look like either the bride or groom. The flower on the bride Oreo can be customized to match the colors of your wedding theme or bouquet. The cookies can be ordered as the bride and groom set, or as bride only or groom only, and they come individually wrapped.The bride Oreos will be packaged with a ribbon matching the flower, while the groom cookie is packaged with a black ribbon. I’m a big fan of these Oreo favors and think they would be a great addition at any wedding. They are super sweet way to celebrate the new couple and you can’t go wrong with Oreos. To make it even sweeter, you could package them with small containers of milk for your guests to enjoy as a “late night snack” after the wedding. That would be great if you had a lot of out-of-town guests who were heading back to a hotel for the night! You can find these Bride and Groom Oreos here. They are beautiful! I bet they taste delicious too!